I recall reading Betty Mahmoody's incredible book Not Without My Daughter, and I have never forgotten how much of an impact it had on me. Over the decades I've often wondered how she and her daughter have coped with the horrors of what happened to them in Iran, and subsequently in this country, upon their return. Mahtob, all grown up, has written her own book, an account of the kidnapping as a child and her life growing up and living in fear that her father would strike again. He did. Her account of their lives is gripping and petrifying. Her life is faith-based and that is what kept her going. That and family. One hears of parents kidnapping a child but unless you hear it firsthand, as opposed to from the media, you don't get the terror and fear they lived through, if they're lucky to survive. Mahtob's own story is one of courage and strength and her solid family base, her incredible mother. Betty Mahmoody's devotion and love for her daughter is heart-wrenching, and shows the determination of a mother on a mission. 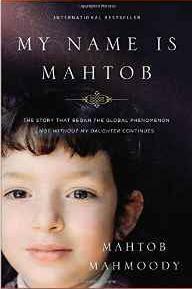 I applaud Mahtob's convictions and achievements despite her serious health setbacks, and their story has changed many laws in this country, and there is hope for children whose parents are fighting for custody, especially across international borders. Mahtob's father was Iranian, and at the time, there weren't any restrictions or laws for international kidnapping, which makes the Mahmoody women's stories so compelling. Conclusion - Thank you for sharing your brave life.